The Lay Centre first opened its doors October 1, 1986, as a "college" for lay students enrolled at the pontifical universities, institutes and athenae in Rome. The first student community included nine young adults from three countries and four Christian denominations. Donna Orsuto and Riekie van Velzen founded the international Catholic Christian community. 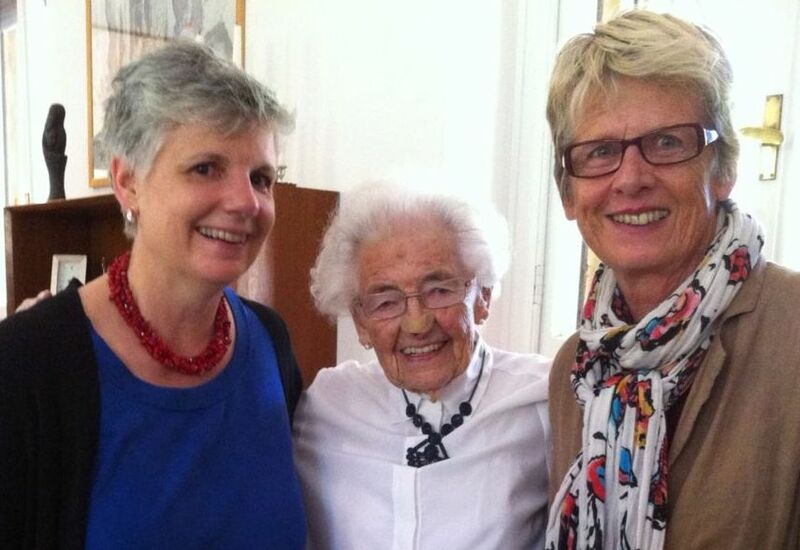 They were committed to continuing the charism of ecumenical hospitality and dialogue fostered by the Ladies of Bethany, an order of Dutch nuns, who carried out this charism for decades from their guesthouse in Rome, called the Casa Foyer Unitas. The Casa Foyer Unitas, located in the Collegio Innocenziano in Piazza Navona, played in important role during the Second Vatican Council, hosting ecumenical observers who met weekly in the neighouring Centro Pro Unione for debriefings with Council Fathers and special consultors. The Ladies of Bethany continued their mission until the mid-1980s, when age and changes to the Roman municipal codes prompted them to downsize their efforts. This opened the way for their two student assistants to come up with a new initiative to the keep the spirit of Foyer Unitas alive. They called it The Lay Centre at Foyer Unitas. For the next 15 years, The Lay Centre operated in a space on the fourth floor of the Collegio Innocenziano. In 1992, when the Ladies of Bethany retired from Rome entirely, a formal board of directors was established and The Lay Centre came out from under the Foyer Unitas umbrella, incorporating in Italy and in the United States as a nonprofit organization. In 2001, The Lay Centre was called upon to relocate, and the community found a home on the grounds of the Pontifical Irish College in what is now the Villa Irlanda guesthouse. In 2009, The Lay Centre moved to its current location in the centre of historic Rome, within the Passionist Monastery of San Giovanni e Paolo, on the Caelian Hill. Over a 30-year span, more than 270 students and scholars have lived and been formed at The Lay Centre. They have come from 64 countries, with the largest contingent – about 37 per cent – from the United States. As well, people of 13 religious traditions have been welcomed among its student community, including Jewish, Muslim, Buddhist, Unitarian Universalist, and T’ienti Teachings. Among the Christians, the majority have been Roman Catholic (85 per cent of the Christians; 63 per cent of the total). Other Christians have included Anglican, Coptic, Lutheran, Methodist, Orthodox, Reformed, Syro-Malabar and Chaldean Catholic. Most Lay Centre alumni live out their ecclesial vocation as laity, developing careers in education and the nonprofit sector. Others serve the Church in different capacities, such as in ecumenical relations, in diocesan curia or bishops’ conferences. A few have discerned calls to consecrated life or ordained ministry. Though few in number, the impact of The Lay Centre alumni has been far-reaching and worldwide.